Skills and abilities: Exceptionally skilled martial artist in various forms of combat both armed and unarmed. She was a member of the coda sisterhood. She appeared to be equal in skill or beyond that of Zealot. 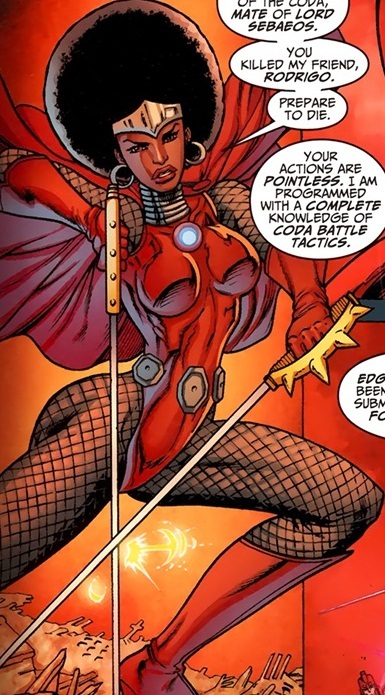 Powers: Her race is stronger, faster and more long lived than the people of earth. She possesses even greater agility and precision thanks to her coda training. Lady Kinnea is a member of the Coda and lover of the Warlord-Sebastion who helped Kheran army kill billions and conquer countless worlds. Over time their blood lust and way of waging war fell out of favor within the Kheran army and they became outcasts. They came to earth and battled Black Halo, Battalion and Voodoo among others. While on earth she killed Spartan after he defeated many from her army. She was killed by Majestic enraging her lover. ← Static Shock and Mister Terrific Cancelled!? !